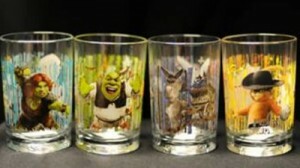 McDonald’s is recalling 12 million “Shrek” glass cups because the paint on them contains cadmium, a toxic metal. If you bought any (they were sold for $2 apiece, according to this report), they should be returned to McDonald’s for a refund. In the meantime, the story says, please keep them away from your children.